Instead of installing a traditional two-piece breasthook at the bow we went with one used on a St Ayles skiff, another Iain Oughtred design. 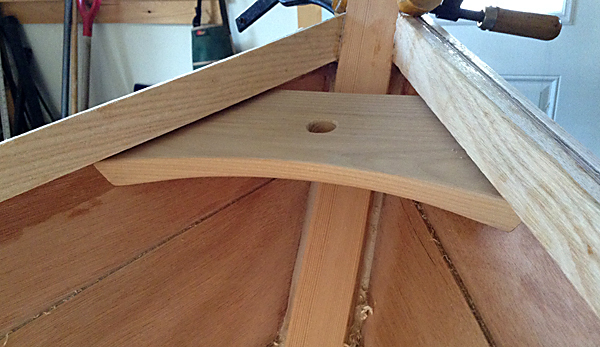 This single-piece breasthook is fastened under the gunwales making it much easier to fit. The aft bottom edge is chamfered to give it a lighter appearance and a hole is drilled in the centre for attaching the painter. 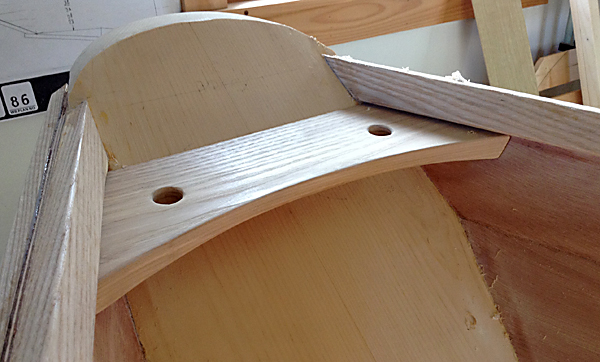 At the stern, we replaced the transom cleat with a variation of the forward breasthook. Fitted the same way, under the gunwales, but this time the aft edge is bevelled to meet the transom The foward bottom edge is also chamfered. Two holes are drilled to attach a lifting rope.